Stay informed about a range of simple and effective ac­tions that you can take. Send us an email and ask to be added to our Action e-mail list. Our work depends on the many people around the state who take action to educate about and restrict genetic engineering. Gather your friends, family and community to sign up for our e-mail list and newsletter. If you are part of a community group, use that venue as an opportunity to educate people about GMOs and what they can do about them. Perhaps your local grocery store might be willing to have sign-up sheets at the check-out. Send the sheets back to us and we’ll take care of the rest! 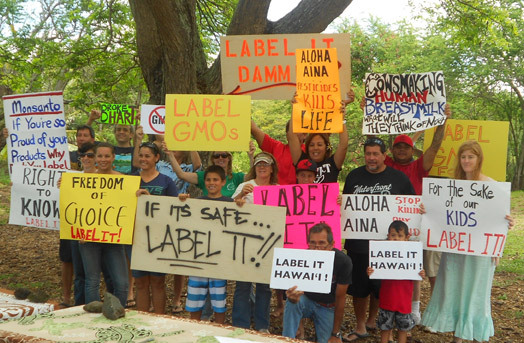 Show Islands At Risk, a movie detailing how GMOs affect Hawai’i, to your friends or favorite community group. Give your friends and community leaders Facing Hawai‘i’s Future, a 96 page book published by Hawai’i SEED. Put a link to hawaiiseed.org on your web page, myspace page, facebook page, etc. Forward newsletters, action alerts, and interesting information from this website to your friends. Print interesting parts of this website to show to your friends over lunch, coffee, or tea.